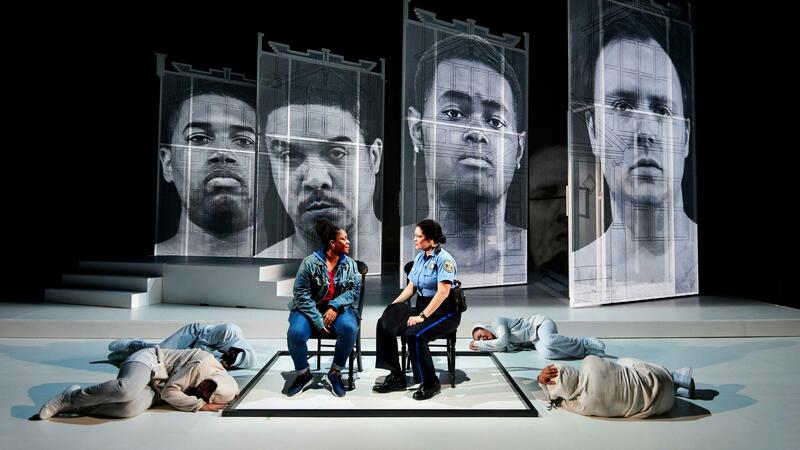 The opera We Shall Not Be Moved revisits the story of the 1985 bombing of the MOVE house in Philadelphia, and that tragedy's impact on Philadelphia's youth. Shown here: Actors portraying the ghosts that inhabit the site of the bombing surround character Un/Sung (Lauren Whitehead, center). The Family Stand, from top left: John Henry (Aubrey Allicock), Un/Sung (Lauren Whitehead), John Blue (John Holiday), John Little (Daniel Shirley) and John Mack (Adam Richardson). West Philly cop Glenda (Kirsten ChÃ¡vez) asks Un/Sung (Lauren Whitehead) why she and her brothers are not in school. Librettist Marc Bamuthi Joseph says that even though the events of the MOVE bombing happened more than 32 years ago, they still haunt the citizens of Philadelphia. "I've heard one person say that the bombing of the MOVE house was like a Sept. 11 event for, you know, people in the city of Philly," he says, "that they'll always remember where they were, and they experienced a collective trauma." So, he and his collaborators — composer Daniel Bernard Roumain and director and choreographer Bill T. Jones — tread carefully. They were inspired by poems created through a teen workshop sponsored by Opera Philadelphia and a local non-profit. 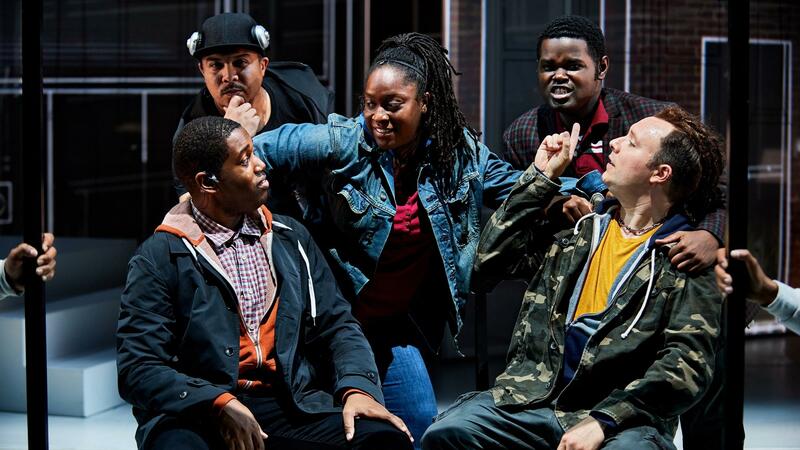 And they cast New York spoken word artist Lauren Whitehead as a 15-year-old girl who leads a group of young men whose school has been closed due to budget cuts. "She arrives at school one day and the doors are locked," Whitehead explains. "She convinces her brothers that instead of going to the other school where they've been assigned, that they should, sort of, squat in the bombed-out shell of a home on Osage Avenue. And she really begins to believe that she's getting lessons from ghosts while she is there." They are the ghosts of the children killed in the MOVE bombing. Roumain says he drew on everything from Bach to Gladys Knight to Eminem while composing We Shall Not Be Moved. "The musical material for the opera, actually, in many ways, began with thinking about Little Richard and even blues music," he says, "just thinking about three notes, three chords: Can I write an entire opera based on three chords, and not as Wagnerian motif, but really more as this notion of the blues?" 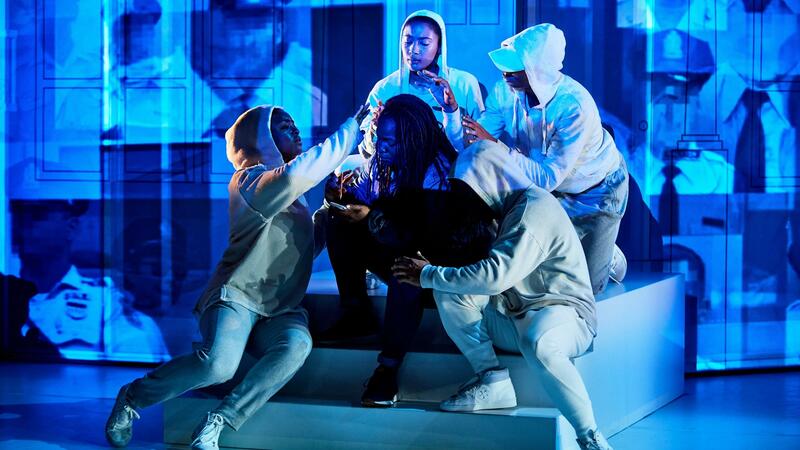 It also draws on R&B – but it doesn't sacrifice the influence of traditional opera. "Glenda, our truancy officer, a wonderful mezzo, is our opera singer," Roumain says. "I think every opera has to have one." We Shall Not Be Moved also features movement created by legendary choreographer Bill T. Jones. Jones, like the rest of his collaborators, is not from Philadelphia. But he says what happened in 1985 still resonates beyond the city limits. "'What you thought was dead is very much alive,'" he says, quoting lyrics from the opera. "Is that true that there's a silence in Philly around it?" he says, "Are we picking a fight where there is no fight? Have the wounds not healed? Have they?" But Whitehead says the opera is very much about the lost children of today. "They just wanted to go to school and school failed them," Whitehead says. "Their parents failed them. The police presence in their community failed them. Every institution, everywhere they turned, failed them. And that's the heartbreaking thing about this opera, I think, is that, you know, it's a true American story of kids who have nothing but each other, and the trouble that that can get them into." It's a different kind of opera, presented in a different way, says Joseph. "I don't know how many world premiere operas have been written by a black man, composed by a black man and directed by a black man," he says. "But that's what we have. That, in and of itself, is shaking up the aesthetic framework of what an opera is supposed to be." Joseph adds that to "delve into the politics and to ask the questions that we do" also makes the opera stand out. We Shall Not Be Moved will be asking those questions to sold-out audiences in Philadelphia before it moves on to New York. "We Shall Not Be Moved" is a new opera that takes its name from both the spiritual-turned-civil-rights anthem and the Philadelphia black liberation group MOVE. That group is probably best remembered in connection with a 1985 tragedy. A police helicopter bombed the MOVE house and the resulting fire killed 11 people and destroyed 62 homes in the neighborhood. The opera revisits that house and its ghosts, but as Jeff Lunden reports, it's very much about young people in Philadelphia today. JEFF LUNDEN, BYLINE: Librettist Marc Bamuthi Joseph says that even though the events happened more than 32 years ago, they still haunt the citizens of Philadelphia. MARC BAMUTHI JOSEPH: I've heard one person say that the bombing of the MOVE house was like a September 11 event for people in the city of Philly that they'll always remember where they were and they experienced a collective trauma. LUNDEN: So he and his collaborators, composer Daniel Bernard Roumain and director and choreographer Bill T. Jones, tread carefully. They were inspired by poems created through a teen workshop sponsored by Opera Philadelphia and a local nonprofit. And they cast New York spoken word artist Lauren Whitehead. LAUREN WHITEHEAD: (As character) Hear me, the bass in mother's roar as she rages. Brown boys in cages. Mental stages stunted in prison. The slave song is vividly vibrant as aurora borealis but only if you listen. LUNDEN: Whitehead plays a 15-year-old girl who leads a group of young men whose school has been closed due to budget cuts. WHITEHEAD: She arrives at school one day and the doors are locked. And she convinces her brothers that instead of going to the other school where they've been assigned, that they should sort of squat in the bombed-out shell of a home on Osage Avenue. And she really begins to believe that she's getting lessons from ghosts while she's there. LUNDEN: The ghosts of the children killed in the MOVE bombing. UNIDENTIFIED SINGERS: (As characters, singing) Something's been brewing since the fire, what you thought was dead is very much alive. LUNDEN: Composer Daniel Bernard Roumain says he drew on everything from Bach to Eminem. DANIEL BERNARD ROUMAIN: The musical material for the opera actually, in many ways, began with thinking about Little Richard and even blues music, just thinking about three notes, three chords. Can I write an entire opera based on three chords, not as Wagnerian motif but really more as this notion of the blues? UNIDENTIFIED ACTRESS #2: (As character, singing) You've been swept up in my faith. UNIDENTIFIED ACTOR: (As character, singing) I believe we make our own faith. Run down and pray with me now, lay down your burdens. ROUMAIN: Glenda, our truancy officer, a wonderful mezzo, who is our opera singer, right? I think every opera has to have one. KIRSTIN CHAVEZ: (As Glenda, singing) Why you talking all this slave revolt, all this down with the system, all this listen to the missives of ghosts. Your brother is a killer. LUNDEN: "We Shall Not Be Moved" also features movement created by the legendary choreographer who's directing the work. Bill T. Jones, like the rest of his collaborators, is not from Philadelphia, but quoting the lyrics, he says what happened in 1985 still resonates beyond the city limits. BILL T. JONES: Yeah. What you thought was dead is very much alive. Is that true that there's a silence in Philly around it? Are we picking a fight where there is no fight? Have the wounds not healed? Have they? LUNDEN: But spoken word artist Lauren Whitehead says the opera is very much about the lost children of today. WHITEHEAD: They just wanted to go to school, and school failed them. Their parents failed them. The police presence in their community failed them. And they don't have anybody to trust except each other. That's the heartbreaking thing about this opera, I think, is that the true American story of kids who have nothing but each other and the trouble that that can get them into. LUNDEN: It's a different kind of opera presented in a different way, says librettist Marc Bamuthi Joseph. JOSEPH: I don't know how many world premiere operas have been written by a black man, composed by a black man and directed by a black man, but that's what we have. That, in and of itself, is shaking up the aesthetic framework of what an opera is supposed to be. But then to delve into the politics and to ask the questions that we do, yeah. LUNDEN: "We Shall Not Be Moved" will be asking those questions to sold-out audiences in Philadelphia before it moves on to New York and then to England. For NPR News, I'm Jeff Lunden. Transcript provided by NPR, Copyright NPR.